Mr. Williams grew up in the small Pitt County town of Grifton. He graduated from Ayden-Grifton High School in 1990, and graduated from East Carolina University with a Bachelor of Science degree in Business Administration in 1994. He then earned his law degree from the University of Florida in 1997 before returning to eastern North Carolina to take the bar exam. permanently in February 1998. 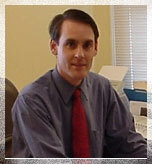 Jason worked at Legal Aid for four and a half years, eventually becoming the managing attorney of the New Bern office. He handled a variety of cases while at Legal Aid, including domestic violence and family law, Social Security and Medicaid disability, Food Stamps and other public benefits, wills and estate planning, landlord-tenant disputes, unemployment claims and consumer law cases. At Legal Aid, Jason practiced in 10 counties in eastern North Carolina representing clients at all sorts of trials and administrative hearings. In 1999, Jason argued a case before the North Carolina Court of Appeals in Raleigh. Mr. Williams left Legal Aid in March 2002 to become an Assistant Public Defender in Pitt County, where he worked until October 2003. During his time at the Public Defenders office, Mr. Williams represented clients charged with misdemeanors and felonies, including many felony drug cases, in both District and Superior court. Mr. Williams’ hobbies include hiking, playing tennis and following the woeful Philadelphia Phillies baseball team. He lives in Washington with his wife.